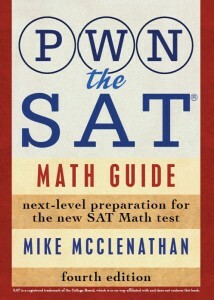 NOTE: This post is about the OLD SAT (pre-2016). The current SAT DOES require you to know things like circle equations and trigonometry. Because the current SAT will also still ask questions like the ones discussed in this post, though, you may still find the information below useful. Circles can be difficult to deal with, especially if you’re approaching them from a very mathy perspective. Approach them from the perspective of someone who grasps that the SAT is not a math test, and you’re going to have a much easier time. Get those things right out of your head. They’ll only overcomplicate things for you, obfuscating the solution. The area of a circle can be calculated using A = πr2. For circumference, use C = 2πr (or C = πd, as some prefer–potayto/potahto). When a wheel rolls one complete revolution, it travels a distance of one circumference. When a line is tangent to a circle, it is perpendicular to the radius that intersects the tangent line. Many of the most arduous circle problems are actually ratio problems! Think of them this way, and you’ll have a much easier time. If you can complete just one of these fractions (for example, if you know the ratio of arc length to circumference), you can figure out everything else. Often all you’ll get are the radius and a central angle, but as you’re about to see, that’s plenty. But wait! We’re not quite done yet. That’s just the arc length around PacMan. To find his perimeter, we have to add the top and bottom of his mouth, too. There we go. Circle questions: not so bad, right? Don’t panic, just work with the ratios. Also try this previously posted challenge question (post contains explanation). I dont get how to do number 16? The fact that it’s a square in the middle means that each circle is missing 90°. So you’re looking for 270/360 (or 3/4) of each circle. Hi, can you please explain number 19? Also for number 16, how would we know whether to find the circumference or the area? For example, I found the area instead of the circumference and it gave me 3π, not the 6π I was looking for. I think, for #16, you’re only counting one side of the figure. You want the TOTAL area of the shaded regions. Each shaded region alone is 3π. Both of them together is 6π. Because the whole circumference is 12π. If you only have π, that’s 1/12 of 12π. i got to pi/12pi = x/360 but how do you get 30 from that? Why isn’t 16 D? I’m having a bit of trouble meshing the shaded regions post with this one. So area of part/4pie (area of whole) = 270/360 is the right way to approach it? I still don’t understand how number 16 is 6 pi. I understand you’re supposed to do 270/360 = x/4 pi. I got 3 pi as a result but how do you get 6 pi from that? Right, but that 3 pi only accounts for one of the two circle sectors. So you have to double it to count all the shaded regions. For #16, I don’t understand why you can’t simply find the area of the two circles and subtract the area of the square from it?? I understood how to solve both questions, but how would you solve this type of question? In the circle above point O is the center and AB is the diameter. If the length of arc ACB is 4pi, what is the length of arc AED? The radius wasn’t given so I didn’t know how to solve it. Arc ACB is 180 degrees, and arc AED is 45 degrees. 45 is 1/4 of 180, so arc AED is 1/4 of the length of arc ACB. The answer is π.